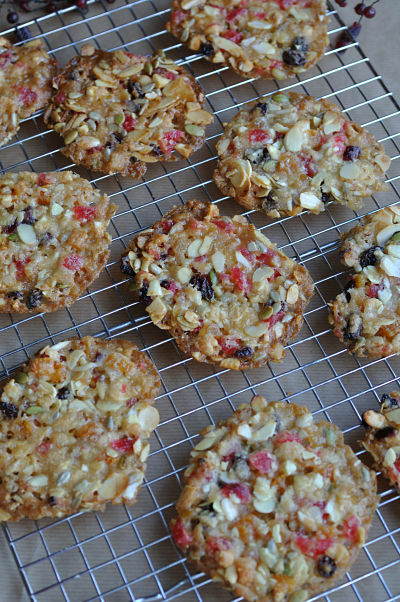 Perhaps someone bought all the ingredients to make their Christmas Cake, left it too late and then thought ‘hmmm, why not make some biscuits instead?’ Or maybe a frugal cook decided that the left over almonds and cherries from Christmas baking would not be allowed to linger for months in the cupboard and in a moment of genius created Florentines. A quick google tells me there are claims to their origins in Austria, Paris and Florence, Italy with the latter of those being the most believable. However, I’m sticking with my frugal cook theory and by the way her name was Florentine. Wherever they came from they are divine and perfect as a handmade Christmas gift. I still have almond essence that I bought by mistake last summer and adding a drop of this to the melted chocolate lifts the Christmassy flavour up another notch. Makes 10 large or 20 small biscuits. 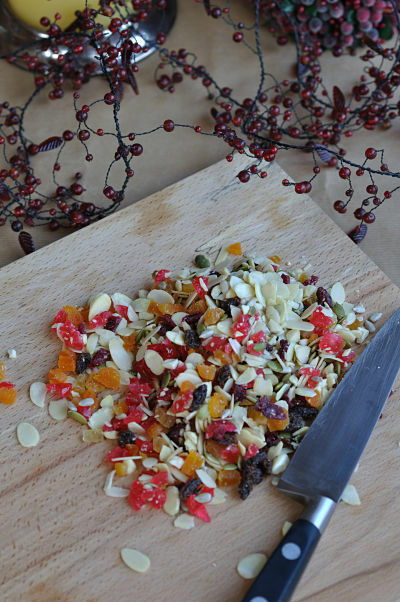 200g total of mixed dried fruit, nuts (include a good portion of flaked and blanched almonds), seeds and berries. Preheat the oven to 190C / Gas Mark 5. Line 2 baking trays with parchment paper. Roughly chop all the fruit and nuts together. Melt the butter in a saucepan over a low heat and add the caster sugar and golden syrup and stir well. Add in the porridge oats and flour and stir well. Take the saucepan off the heat and stir in all the dried fruit and nuts. Use a pastry cutter to shape a spoon of filling together on the baking tray and press down to firm it up. Leave room between the biscuits as they will melt and spread a bit. Bake for 10 minutes and remove from oven when looking golden and starting to crisp at the edges. Transfer to a baking tray and allow to cool completely. Melt the chocolate in a bowl in the microwave (1.5 to 2 minutes). Add a tiny drop of almond essence (optional) and stir well. 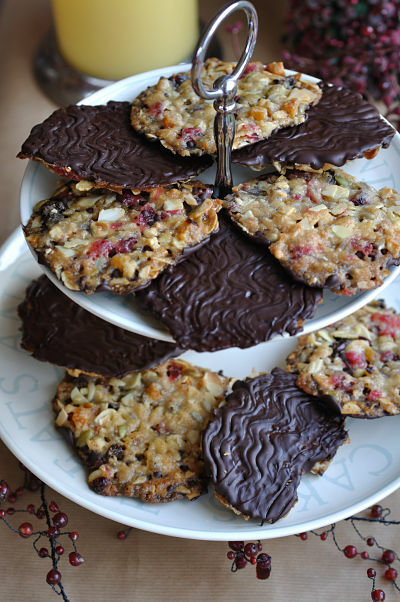 Turn the florentines upside down and use a teaspoon to coat the underside with melted chocolate. Leave to cool for a few minutes and then use a fork to make swirly lines before leaving to set completely. Not only does this recipe look delicious, but your photos are absolutely mouthwatering! 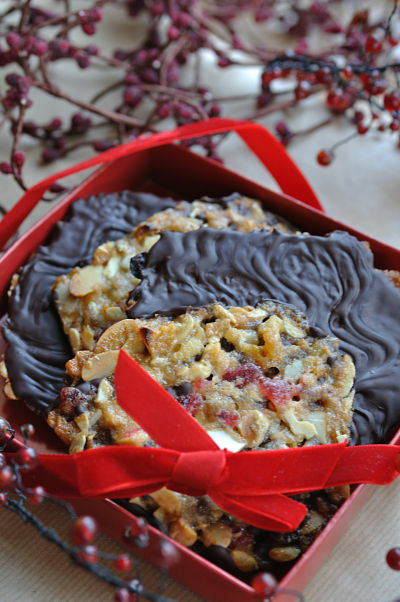 Your florentines look so good! 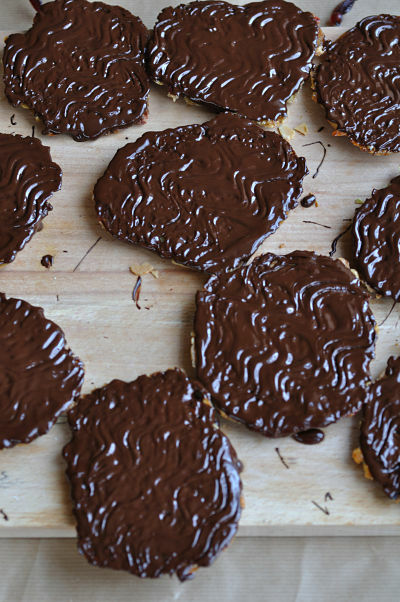 I’ve been searching high and low for good florentines recipe, but most of them look like they are boring plain caramelised almond slices renamed as “florentines”. I’ve saved this and can’t wait to try it out!